This photo is a part of an ongoing series of images, an experiment of sorts with scale, photo traditions, and romanticism. In the image is a smaller image of myself decked out in my proto-indigidyke gear. 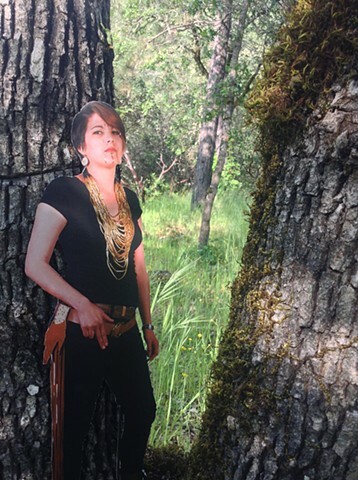 The image is of a cardboard cutout set in my homelands, natinixwh, a collision of reality of place and fantasy of persona. It wryly draws on the non-native photo tradition of using indigenous peoples and regalia to create a Franken-Indian idea of what indigeneity looked like. This exploration is a small drop in the current effort to change that status quo and complicate indigeneity.